This year’s CES 2014 brought the US model of the LG G Flex: the flexible and curved 6-inch tablet is LG’s new claim to fame. I had a chance to spend some time with the new banana-shaped smartphone in the LG press conference and pavilion. Here is a first impression and short hands-on review of the LG G Flex. The first glimpse at the LG G Flex signals that this is no ordinary phone, a first of its kind in fact. The 6-inch body is slightly curved inwards and according to LG, should provide the user with a better listening, viewing and talking experience, not to mention fit more ergonomically to the shape of your face. Also, when set down on a flat surface, the speakers aren’t covered, so muffled sound isn’t an issue either. Not only that, it is the first flexible device to reach the market, and this flexibility makes it much more sturdy and durable. The body is actually quite light for its bigger size, at just 177 grams, it didn't feel much heavier than my Galaxy S3 which I held in the other hand. The design is definitely interesting, though I wouldn’t say that, with its plastic chassis, that it is elegant. Some might disagree, as it is quite similar to the LG G2, which is one of the world’s best smartphones. With the numerous people touching the device, it was quickly spattered with fingerprints making it actually quite unattractive. That being said, it does possess a back-healing cover thanks to a special resin coating. This means that if you scratch it with a key for example, the marks will disappear after a few hours. It does, on the other hand, have a good feel when held and doesn’t give the impression of breaking easily. You will find the iconic LG back-facing buttons for volume controls, power and physical shutter buttons. In my opinion, the real beauty of the device lays in its superb display which immediately captured my attention. The LG G Flex has an HD OLED display with a resolution of 1280 x 720 and 245 ppi, whose image is enhanced thanks to the curved body. LG believes that the curved screen reproduces more natural viewing, imitating how you see when looking around in the real world, like a panoramic image. I can really attest that it has great color representation, viewing angle, contrast and saturation. The big screen is ideal for video watching and when I watched some of the demo videos found in their library, I really liked what I had to see. I can imagine that playing games on the device would also be enjoyable, though I didn’t have a chance to do so yet. Compared to other Full HD displays, it might not come up to par, but this is yet to be seen when held side by side with another device. LG packed its usual interface into the LG G Flex, and in addition to the features which were brought for the first time with the G2 and G Pad, incorporated a few new ones. The LG G2 features brought here are KnockOn and Guest Mode to name a few. The first of these is its multitasking capability. Long-pressing on the back button easily brings you to this function by presenting you with a list of apps to choose from. You first long press and drag one up to the top part of the screen and then the lower part. From here, you can easily swap data from app to app, like an image to an email for example. There is also a new feature which can be used from the lock screen: "QTheatre" has the user drag their fingers as if parting the curtains in a movie theater, a reverse pinch. This unveils a few options to choose from for viewing videos. It impressed me as well. Gunned with a Qualcomm Snapdragon 800 quad-core processor ticking at 2.26 GHz and 2 GB of RAM, it won’t come as a surprise to you that, with the best in mobile processors, the curvy smartphone runs smooth as butter. Flipping through home screens was quite fluid, apps opened without a seconds' delay and videos didn’t lag either. The LG G Flex is filled with the camera features of the LG G2 with one new addition in order to help users take selfies with the better, 13 MP back-facing camera. When you launch the camera app and turn it around so that you are looking at the back lens, an LED light right in the buttons will blink yellow as it tries to recognize your face. After this, it will shine green when it has you in dead center and you press the physical button in order to trigger the shot. This will enable you to get better pictures without needing to guess where it is pointing. The front facing camera has 2.1 MP resolution and is also an ok camera as far as high-end smartphones go. The pictures which I took were standard though not mind-blowing. The thing that the G Flex is missing is optical image stabilization. It also has your usual camera modes and settings, like Dynamic and Time Machine. Though the LG G Flex is not much heavier than my year old Galaxy S3, its battery surpasses the S3's exponentially. The new bendy smartphone comes with a 3,500 mAh Li-Polymer battery. This will last you a long time, I have no doubt. Though, of course, in the short time in which I spent with the device, I was not able to actually test it. The creation of their new bent battery will surely just be the beginning though. The battery is of 3,400 mAh for T-Mobile. With the launch of the new LG G Flex, there is no exact date as of yet in terms of release in the USA. The price is also still hush-hush. All that they would say is in the first quarter of 2014. When it does appear on the scene, it will be available with Sprint, AT&T and T-Mobile. Sprint actually has a partnership with LG in that all the network bands of LG will be provided with Sprint. After a short time spent playing with the LG G Flex, I can say that I am indeed impressed with a few things that LG did: the display is quite nice and the performance, thanks to its super-fast processor, are undoubtedly major perks for this Android device, placing it at the head of the smartphone race. I am not sure if the design will do well on the market, but it is definitely a head-turner. It is also a shame that the camera is only so-so, with no OIS. Though I didn’t like the look of the material, it does possess a high-end look and feel and is super light-weight, a nice touch for such a large smartphone. And there’s the battery which is great as well. Of course, more testing would need to be done to really discover the LG G Flex’s entire scope and range in software and battery life, so we will conduct a test when we obtain the smartphone in our AndroidPIT office. 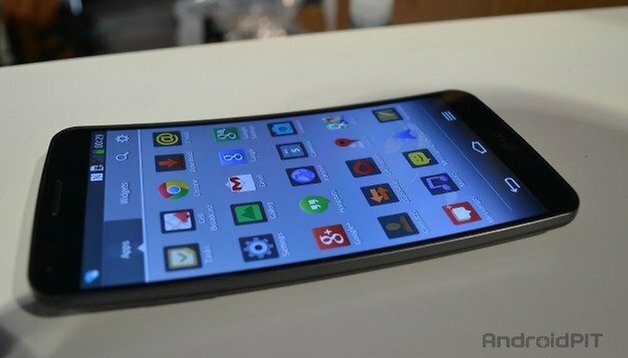 What do you think of the LG G Flex? Is its curved body something you would have yourself or are you still a bit sceptical? I like this phone depending on the price.I would buy this phone .I like the shape it would be so comfortable for the ear & face.and it is so light weight.and does eveything I like on a phone..Just Love everything about it .can't wait to see it.. my current phone is a LG-E400 which I find very good,and our T.V. is LG. as well..